For the second straight post season, the Wellington Dukes have comeback from a 3-1 deficit and forced a Game 7 in the second round of the Buckland Cup playoffs. Wellington won Games 5 and 6 over the Whitby Fury to push their East Division finals to an ultimate Game 7 Tuesday night at the Iroquois Sports Complex. The defending Buckland Cup champions forced the issue by virtue of their Game 6 4-2 win at Lehigh Arena on Sunday afternoon. Over 600 in attendance on Sunday saw Wellington jet out to a 3-0 lead through two periods. 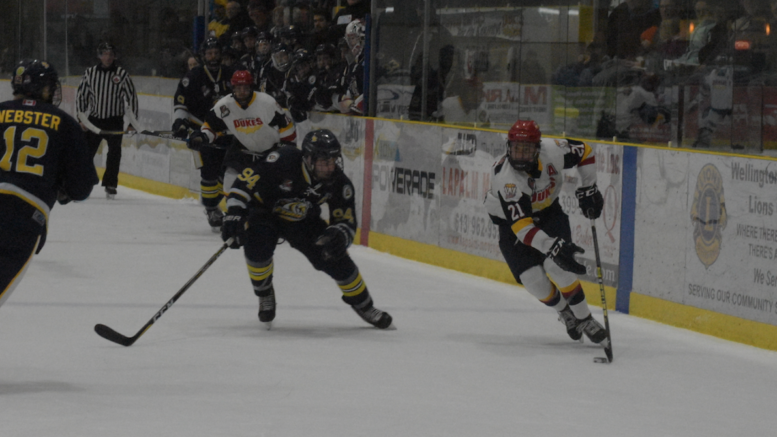 The Dukes opened the scoring when Keenan Eddy sprung Dawson Ellis on a partial breakaway and the Campbellford, ON native was able to slip the puck past Whitby starter Luke Pearson with just under five minutes left in the frame. Wellington would net a pair in the second. Quinn Hanna would blast a puck past Pearson into the top of the net at the 3:36 mark to make it a two goal spread. Then, inside a minute left in the third, Andrew Rinaldi was able to shake off a heavy hit and make his way to the Whitby net where he deposited a Tyson Gilmour pass between the wickets of Pearson for the game’s eventual winning tally. The Fury would push back in the third with Noah Dollo banking one off a Wellington defender at the 5:00 mark and then Shane Bull beating Wellington starter Logan Bateman off a rebound at 11:44. Whitby would press for an equalizer but none came as Bateman was solid the rest of the way. Wellington got off to a slow start in Game 5 and it was the Fury getting out to a 2-0 lead before the game was barely 10 minutes old. At the 3:19 mark of the first, Carson Gallagher made a nice backhand feed cross crease to a wide open Noah Dollo who lifted it over Bateman for a 1-0 lead. Later in the frame it was Greg Smith finding Shane Bull at the lip of the crease on a 2-on-1 rush to extend the Fury lead to 2-0. Wellington had their chances later in the frame but Pearson continued to come up with the types of saves that left the Dukes shooters shaking their heads as they wondered back to the bench. Finally Wellington broke through when Dan Panetta cruised across the Whitby blueline and found time and space to rip a top shelf effort past Pearson at 18:38 to give the Dukes some life. In the second, Wellington would even things up early as Ben Woodhouse collected his own rebound and beat Pearson low to the glove side from in tight at 3:31 to make it 2-2. In the third, Wellington got their first lead of the game just over five minutes in when Tyson Gilmour won a draw to Jacob Thousand who immediately slipped the puck to Elijah Gonsalves. Gonsalves would wrist a puck past Pearson to and stake Wellington to a 3-2 margin with over 14 minutes left in the stanza. Wellington would take a page from the Fury who have found great success in this series clogging up the middle of the ice and stymie the Whitby shooters in the final moments of the contest. The Dukes finally got a break and it was quite literal as Nick Lund would snap his stick when trying a point blast in the dying moments of the game. The loose puck would eventually be air lifted to safety in the Whitby zone and the contest would end in Wellington’s favour. Puck drop for Game 7 will be 8 p.m. and the action can be heard on County 99.3 FM.